Last week for Monday's Meal I shared my recipe for fresh pasta made from scratch. It's really very simple to do. If you'd like to see it, click here. This week, we'll put that pasta to use with one of the most delicious, yet easiest, recipes I know: pasta Alfredo. My favorite version of pasta Alfredo is also the simplest. It requires nothing more than pasta, butter, water and quality Parmigiano-Reggiano. In this country, most people tend to think of a thick, creamy sauce when they think about Alfredo. As I said though, I prefer a version unadulterated by cream - the type you see most frequently in Italy. Obviously, with so few ingredients it's critical to have the highest-quality ones. Don't even think about using any cheese other than imported Italian Parmigiano-Reggiano. And, fresh pasta is great, but high-quality dried pasta will also work just fine. You could use whatever pasta shape you prefer with this recipe. I like thick, homemade fettuccine that is firm to the bite (al dente). Cut the butter up into 1/4-inch pieces (more or less). This will facilitate quick melting and the butter won't burn. Cook the pasta in a large pot of salted water, according to package directions if using dried pasta, until just barely al dente. 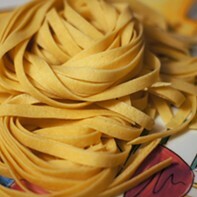 Fresh pasta will take only a few minutes to cook, depending on the shape and thickness. While the pasta is cooking, melt the butter with a pinch of (optional) nutmeg in a large, deep pan. Before draining the cooked pasta, scoop out and reserve about 1/4 cup of the cooking water. Drain the pasta and add it to the pan with the butter. Toss well with the half cup of grated cheese and, if necessary, add some or all of the reserved pasta water to loosen the sauce. I call the Alfredo "sauce," but this version is more of a light, buttery coating than the thick, creamy sauce found in most American restaurants. Serve immediately on warm plates or in warm bowls with additional grated Parmigiano-Reggiano for topping at the table.